Cheese connoisseurs rejoice! California's award-winning Cowgirl Creamery is setting up shop in Penn Quarter, with a scheduled April 6 opening, reports the New York Times. 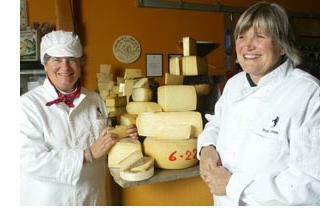 Founders Sue Conley and Peggy Smith (pictured above) are both from the D.C. area and plan to bring a selection of their award-winning cheeses as well as cheeses from other small producers to the District. Conley told the Times that the shop will offer a cheese bar where shoppers can sample the cheeses with wine tastings. 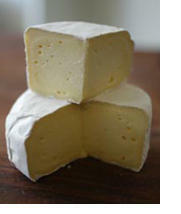 Cowgirl Creamery's cheeses include the triple cream Mt Tam (pictured at right), described on their Web Site as "firm, yet buttery with a mellow, earthy flavor reminiscent of white mushrooms," and the Red Hawk, "aged six weeks and washed with a brine solution that promotes the growth of a bacteria that tints the rind a sunset red-orange." The shop will be located at 919 F St. NW next to Central Liquor. Wonderful! we can't have too many good cheese shops.